When viral video of a terrorist attack in San Francisco reveals that a Federal witness long thought dead is still alive, the organization he’d agreed to testify against will stop at nothing to put him in the ground. Special Agent Charlie Thompson is determined to protect him, but her hands are tied; the FBI’s sole priority is catching the terrorists before they strike again. So Charlie calls the only person on the planet who can keep her witness safe: Michael Hendricks. Once a covert operative for the US military, Hendricks makes his living hitting hitmen… or he did, until the very organization hunting Charlie’s witness—the Council—caught wind and targeted the people he loves. Now Hendricks is determined to take the Council down, even if that means wading into the center of a terror plot whose perpetrators are not what they seem. "An explosive followup to THE KILLING KIND... an electrifying read, a book that pretty much demands your total attention till it's finished." "Original and exciting... Hendricks is poised to join characters like Jack Reacher, Harry Bosch, and Spencer on reader’s must-buy lists for years to come." "In his second Michael Hendricks thriller, Holm performs authorial acrobatics, elegantly and nimbly leaping between various locations and voices to produce not just a suspenseful tale kicked off by a San Francisco terrorist attack, but one imbued with multiple fine characters to boot." "Fast paced... masterfully plotted... Put aside a full night, RED RIGHT HAND is so engrossing you won’t want to put it down." "An incredibly captivating thriller, one that kept my heart pounding long after I finished the last pages... Highly, highly recommended." "THE KILLING KIND earned a stack of plaudits, but RED RIGHT HAND is the rare second entry in a series that actually rivals its predecessor." "This follow-up to the acclaimed THE KILLING KIND (nominated for four major mystery awards, including the Anthony) is a real thrill ride. Jeff Abbott fans and adrenaline fiction junkies will appreciate how vividly the shadowy world of military contractors comes to life in Holm's skillful hands." "Rating: 5 out of 5. Pretty much the perfect thriller... The action is mile-a-minute and yet [Holm is] willing to take his time and have lovely character moments that don’t undercut the flow but instead enhance the feeling of speed and adrenaline... it’s impossible to put down... I knew Chris Holm to be a great writer before this book—but now, I think, the world is going to be in on the secret, too." "A terrific antihero... This book is perfect for readers in search of a high-octane, action-packed thriller." 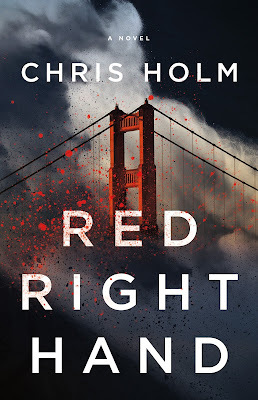 "RED RIGHT HAND is [a] perfectly paced page-turner: Holm elegantly juggles multiple characters, perspectives and locations, without a single misstep." "Hard-hitting... Holm manages to write a book about terrorism that isn’t about terrorism, a book about violence that isn’t about violence, and succeeds without precedent on both counts. A surefire winner for thriller fans and beyond."